Some orbs whose mission is to carry a message of peace, normally, retain the circular shape. There is no beginning and there is no end. Many scientific ideas are all the result of information from the square, the oblong and the diamond shaped orbs. If you consider this to be a theory remember that all facts began as theories. Orbs and energy streamer are not hesitant to share information with us. They are hesitant about the energetic force we as individuals carry, remember to them we are still very primitive. Once they have concluded that a person or persons thought patterns and energetic force are non-violent then they begin their contact. 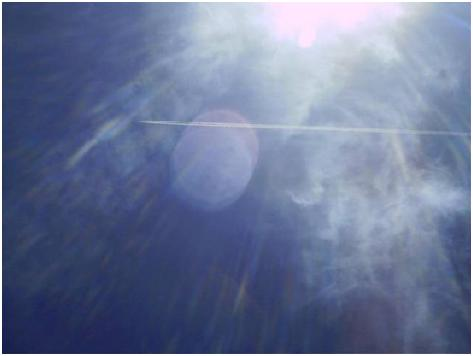 Energy streamers are of course free form energy as well; they are orbs without the formal defined shape. Energy streamers are also photons of light which carry knowledge, truth and the light of that particular entity. Streamers tend to look like ribbons blowing in the wind; sometimes they can look like an "S" shape, but a moving one. We have seen them moving the lower part of their streamer, while at the same time keeping the upper part stationary. At times they seem to be trying to write, as in the formation of words. Many of the energy streamers we have seen are a light green color although they do appear in many other colors as well. Energy streamers differ from orbs in a unique fashion, they are orbs, yet they free flow in a different style, while the majority of circular and other shaped orbs seem to prefer the vertical descent and ascent to this planet. 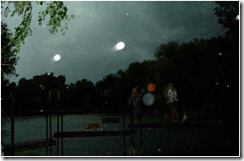 Orbs don’t seem to be much bothered by wind, yet we have seen them in a slanted position, almost as though they were chasing the wind. When they are attracted to a person or an object they tend to remain very, very close. 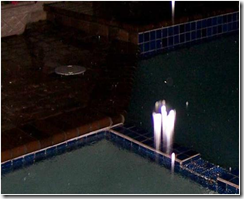 Orbs and streamers can be anywhere from a few inches away to directly on the person or object. 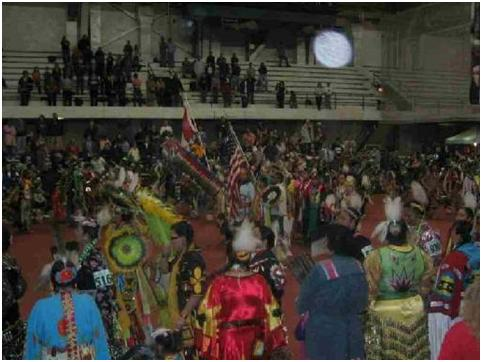 Energy streamers vary from one single orb streamer to a multitude of streamers all visible at one time. 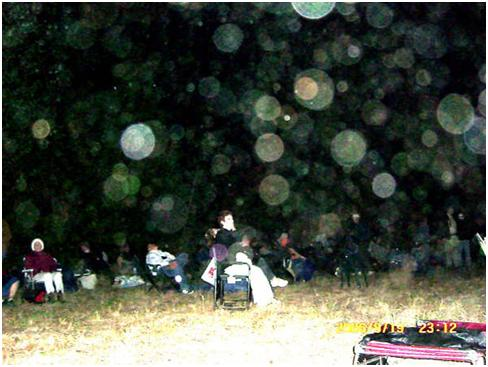 Although some orbs and streamers are solitary, most tend to travel in larger groups. They all use their telepathic abilities to transmit information to each other. In this way the beneficial orbs and energy streamers avoid precarious locations where the energy is very negative, where the humans are very cruel. Energy streamers seem to linger visibly much longer than other shaped orbs. 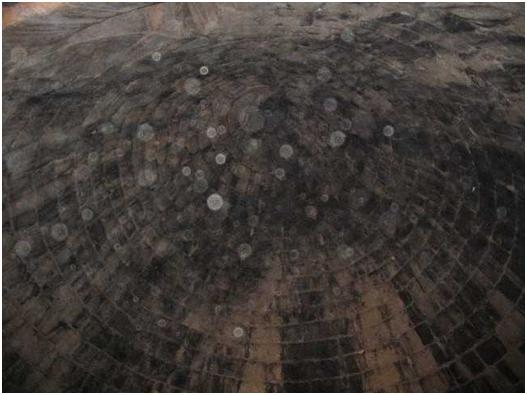 We have seen one energy streamer that had forms resembling tiny little mirrors attached to itself in a diamond shaped pattern. It floated about three feet above us for about 20 minutes. Then it just suddenly and slowly appeared to fade out. Here are some comparisons between the malevolent orbs and streamers and the beneficial ones. As with all life forms, there are those that are the illuminated ones and those whose tendencies are for self gratification much as the Illuminati is. Malevolent orbs tend to be a few bricks shy of a load. The malevolent ones are all attracted to same the type of individuals and places that contain the same malevolence and violence that they themselves contain. They are attracted to any kind of discordant energies or frequencies that reverberate on the same frequency as do they. The orbs and streamers that contain the faces of pure evil always migrate to the same type of energetic force that they can magnify that lives on this planet. The malevolent orbs carry visibly the energies that are of pure evil. We have seen an orb that carried the stereotype picture of what is called the devil. They are blatant in their exhibition of evil; they are not trying in any way to hide what they are. They perform as the exact opposite in every way that the beneficial orbs do. They have the same shapes and colors, but that is all they have in common. No one can attract a malevolent orb to themselves unless they themselves are evil. This does not mean to say you won’t see them. Keep in mind the need for personal discretion when communicating with orbs. You can’t mistake the two different types; the beneficial orbs carry the Souls that are the pure radiant happy faces. There is a peaceful feeling about them. Often times you will see in the beneficial orbs the fetuses of the babies about to be born, the features of the fetus are very clear and defined. All beneficial orbs are radiant beings who are happy to be here. Once you have successfully established communication with these orbs and streamers they will be your lifelong friend. You can tell us of your experiences and let us know if you wish for us to post them for others to read as well. For anyone who has been calling in the malevolent orbs, we don’t want to talk to you anyway. The following is a message from the Orb Minashi. Minashi is our constant companion and our friend. 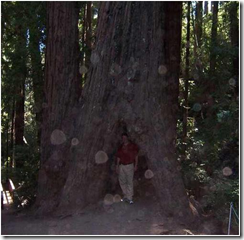 "We as orbs find most humans fascinating and extremely curious. Most of you see things through third-dimensional eyes, missing all the wondrous beauties that surround you. Life is abundant with mystery and rarities. Why is it that so many of you refuse to use what was God given to you? We like you, are continually evolving. We search for answers and seek betterment in ourselves, just as you were intended to do. We are orbs, we are living entities experiencing all that life has to offer. At times, we also take human form. We are not so much different you and I. In the earlier days, before the invention of your "digital cameras," only those of you who knew that everything is alive and related to everything else, were able to see us. We, when asked, are ready and willing to assist you humans in your evolutionary process. We are not here to hide or bewilder or bedazzle, or confuse you as to our presence. We have always been, just as you have always been upon this planet you call earth. The totality of our expression is mirrored in All That Is." "We are alive, sentient beings who are not bound by your third dimensional rules. We travel when and where we please, simply because we can. As your planet reaches this critical stage in your evolution, we will be here as all StarKeepers are, to smoothen the transition. Oh, by the way, you fascinate us as much as we do you." 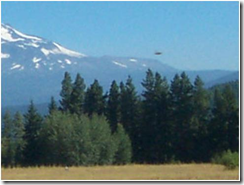 We will be speaking only on the beneficial Orbs in part 1 of this article. Part 2 shall offer the revelations concerning the malevolent Orbs. 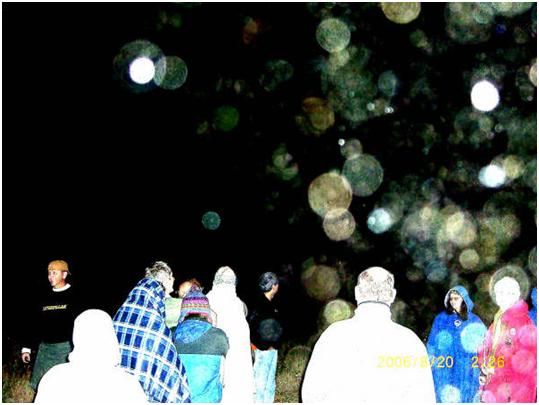 Orbs interact with human beings and those who are not, who possess and vibrate with the same frequencies as the Orbs themselves. As Universal law states, "like attracts like." Basically there are three types of orbs; there are the completely matured adult orbs, those in puberty, and the infants, the teeny ones. Orbs "birth" other orbs, the orbs are self propagating, they emit the tiny orbs at specific timelines when the adult orbs have absorbed all the data on this planet they came here to analyze. When they emit the new orbs, each new orb carries a type of genetic encoding. This means that all the qualities perfections, imperfection, wisdom, love etc. that orb number one possess, undergoes a "form of transference" by the newly emerging orb. Because they possess "infinite knowledge," their own magnetic force field expands like a direct ray of light. They are then in alignment, in "geometric correlation," to all other orbs sharing the same commonalities. This has the effect of attracting each to the other, while at the same time passing on the knowledge and wisdom the individual orbs have gathered in their travels. However, they also possess infinite understanding of the conundrums which the human race as a whole exemplifies. Orbs do not enter states of confusion, they are purified energy. Yet because of their origins, they acknowledge with compassionate detachment the foibles of the human race. In other words, they are not here to pick up any human’s bad habits. This part is considered to be on a need to know basis. Now you have a need to know. Every time the earth star planet has begun a shift, throughout the entire history of the planet, orbs descend to also assist in the stabilization of the grid, there by stabilizing the earth star system herself. Take this for what its worth, for it is worth its weight in gold. 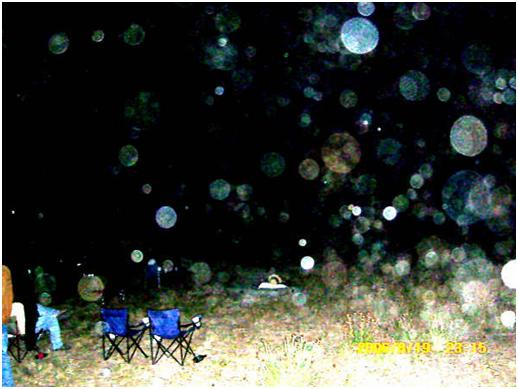 Orbs are here to observe. They are here to offer assistance to those beings, human and otherwise, who have been awaiting their guidance. They are also record keepers. Think of them as your own personal diary, they know everything you do, And..fail to do. They have the ability to see everything in simultaneous fashion; they do not honor linear time, for they know it does not exist. They honor the reality of linear time as a purely human belief. As we have previously stated, earth is the only place in any universe where linear time exists. Here is a special message from one of David’s primary orbs. He has granted permission for us to give you this message. "We travel at times of "least resistance," i.e. when the conditions are right. We also interact only with those who possess the purest of intent and the desire for expanding upon the true essence of All That Is. So to speak, we are true sentient beings. In times past, many amongst us were as you are today, floundering around in search of the meaning of life. From infancy to adulthood (as most humans can perceive life) we are expanding, growing and harmonizing with All That Is. To be any different would suppress the Creative process of the universe. Time and time again, we have come to complete manifestation on the earth star planet for the Soul purpose of our own personal evolvement. Our previous lifetimes were for the experience of living a human life, yes we have also been Walk-Ins in prior times, but not always. Many of us who you have seen in fragments of your peripheral vision are merely traversing through dimensions capturing the essence of the moment. Remember, we are explorers as well as record keepers." They see everything, they hear everything. They possess the same ability to transmit information that the enigma stones do. What one enigma stone observes, it immediately transmits to all other enigmas. In this manner orbs encode what they see throughout their entire orb clusters, much as the individual Soul groups on this planet do. You need to understand, many of these Orbs have lived many previous lifetimes on this planet in human form, as well as in other forms. There are veiled references in the bible that allude to Souls and Incarnation. When the Soul leaves the human body, in micro seconds before physical death, Soul then begins an individualized "Soul Journey." At a specified span of "now," Soul has the opportunity to traverse galaxies as orbs. Sorry to rock the proverbial biblical boat here, but THAT is the way it is. It is all part of the learning process, of the Evolution of the Soul and of Godhead expressing HimSelf as a Vessel. Remember, they are pure sentience. We cannot stress this enough. 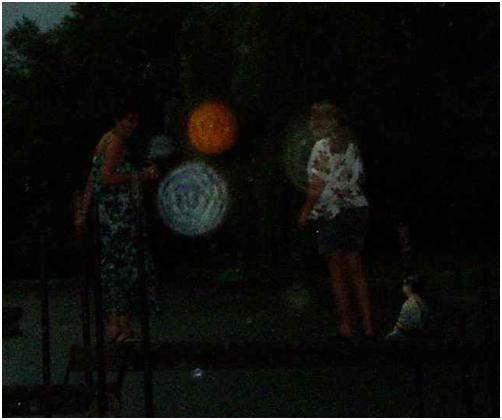 Orbs understand everything you say and do, because they are formed of all the sentiments. In other words, what is known on the earth star planet as clairvoyance, (to see clearly) clairaudience, (to hear clearly) clairsentience, (to feel and sense clearly), is the ultimate description, of the Absolute geocentric Orbital Revolving System. They test the theories of this universe and find them lacking in truth and Absolute reality. They are at times, also geomorphic. They have their own language. 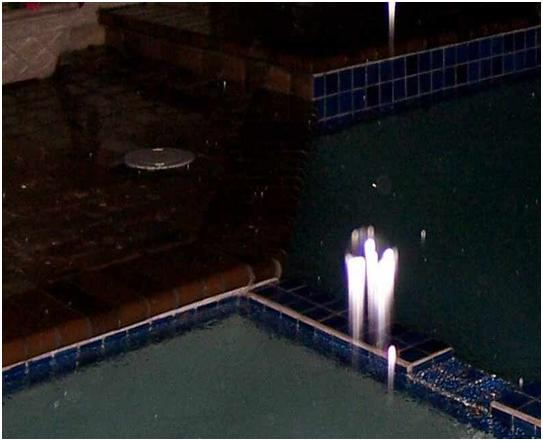 Orbs use the language of light, and other geometric forms to communicate, i.e. form energy. They can feel danger, evil and malcontent in anyone’s mind and all other imminent earth changes. 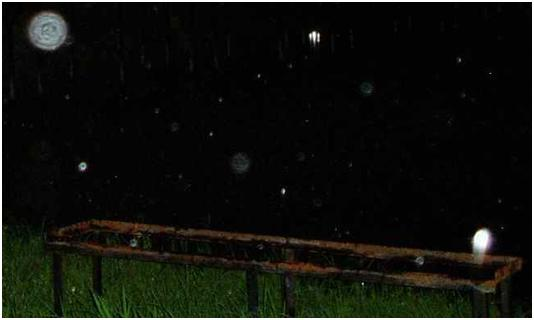 Orbs then react accordingly. 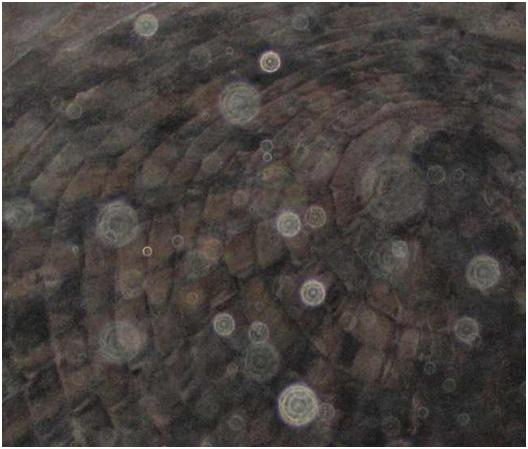 They respond to high frequencies generated by flute, different musical scales, octaves, singing and dancing. They are especially fond of music because they resonate with the music of the spheres in the higher dimensions. By the way, there is no heavy metal or Rapp music in that sphere. If you have any Pleiadian, Arcturian, Andromedian, Syrian or Native American music, you will find they have an instant attraction to that. Also if you have any of the astrological charts geometry music they will respond to that. Vibrationally, orbs align with joyous laugher; with the personification of evolved Souls who are in contact with Higher Forms of Wisdom, we speak of those who are not of this earth. Orbs can reflect the prism of the rainbow in color, harmonizing with all that exemplifies the true beauty of the Creation. The benevolent ones are of the Highest Form of Divinity; they cannot tolerate anything that is not. To them any type of swear word is a form of bastardization of energy. 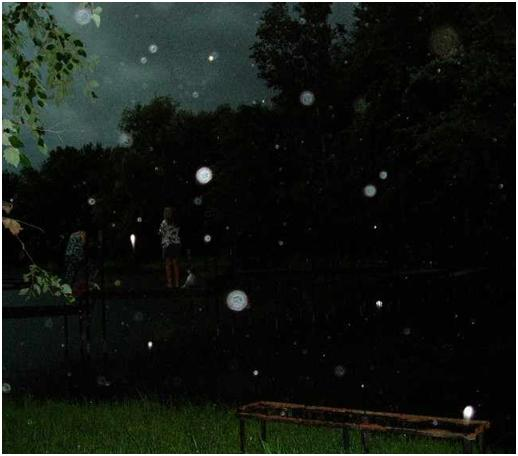 Orbs are innately suspicious of the irrational reactions of human beings. Some have been heard to say, "been there, done that." They have the ability to change their colors, they can be pink one moment, blue the next. There are good reasons why they can be visible to some, or invisible to others. Their visibility to us is dependent upon the intentions of the individual(s). They can also immediately "cloak" themselves when they do not want to be seen. You can ask them to be held in your hands, you can juggle with them, remember like all universal beings, they have a great sense of humor. They are extremely astute; their intelligence factor is not from this earth; they are older than this planet, they have been here since the original Creation of the earth planet. 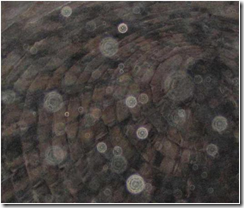 Orbs are as old as the Creator and the Creation. Long, long ago, ancient evolved civilizations revered the presence of the Orbs. They called them, "the stars that fall from the heavens." 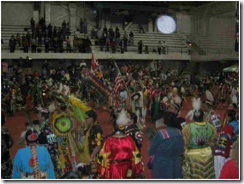 Cultures that were the primitive ones were highly superstitious of the Orbs presence, that is, when they were permitted to see them. Unfortunately, those cultures equated the Orbs with "evil omens." 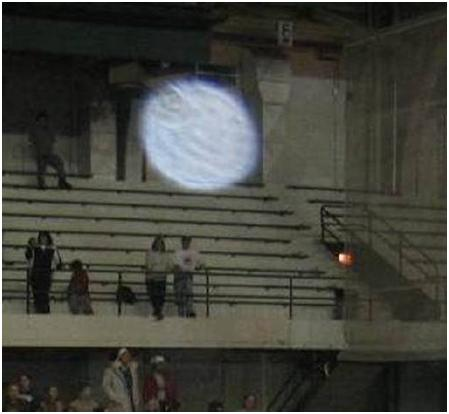 Just as humans evolve and learn from their experiences, so do orbs. Also, they respond most joyously to the visible presence of UFO’s, this is because they align themselves with the benevolent Star Keepers. They share a common heritage. They are part of all realms including the angelic realm. Yet they are not ghosts, contrary to what has been reported by the Sci-fi channel. These are fear tactics that are going to scare people and create terrible repercussions. Please Do Not fall into this media hype. We have noticed during our interactions with the orbs that they are particularly attracted to the different frequencies produced by our Pleiadian flagship star crystals, (we have several in the house.) We have also noticed an increased activity of orb presence while we are "playing" with the Atlantean wands and walking sticks, and during times of meditation. We have received letters from others who have had the same experience. We are presently attempting to record and photograph the results being seen and heard. The other presences which many of you are witnessing are Energy Streamers. In part two of this article we will explain the difference between energy streamers and orbs. Now for those of you who are "prophecy buffs," somewhere in the text above we have shared with you a REVELATION, (and yes, it is in the book of Revelations) a secret. As most know, only certain parts of the Holy Writ, the Bible, have recently been decoded, this due to the timing necessary for certain events to unfold. The secret key which was known by ancient civilizations now is available to you to unlock what is now known as "the future." It is in here, go my children, seek and find it.
" 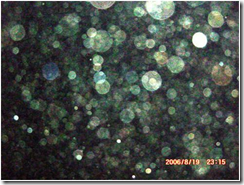 THOSE ELUSIVE LITTLE ORBS "
" THE LITTLE RASCALS ARE EVERYWHERE "
So what is all the big fuss about Orbs these days? 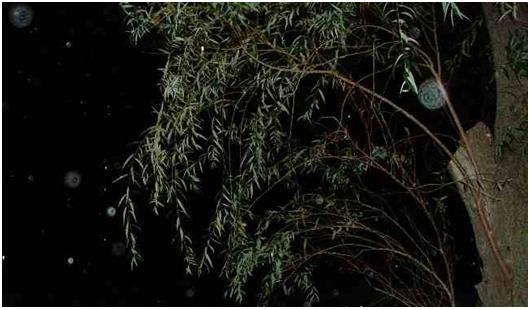 They appear out of no-where and vanish into the stillness of the night. They are in your house, they are outside, they are everywhere you go. Are they following you around? Are they real or are your eyes and/or camera just playing tricks on you? We will let you be the judge of that. Sometimes the truth appears stranger than fiction. 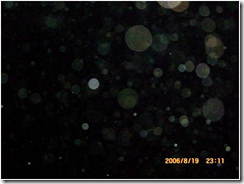 Scientists have known about the orbs for a long time now. So why does your digital camera, your Polaroid pick them up and yet they are unseen by the naked eye most of the time? Simply put, the naked eye does not have the depth perception that the third eye has. For the average person, eyes can only see what they believe consciously exists, such is the limitations of using only the five main senses. 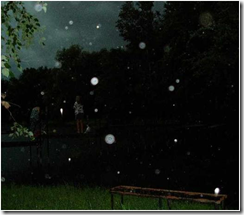 Orbs are actually quite visible in the daytime, just as stars are visible in the daylight if one were to look hard enough to see them. It is merely a type of optical allusion that causes people to forget about the basics of light matter. They forget that light, because of its natural illuminative quality, projects so many rays that it "cloaks" not only the stars, the constellations, but the Orbs as well. 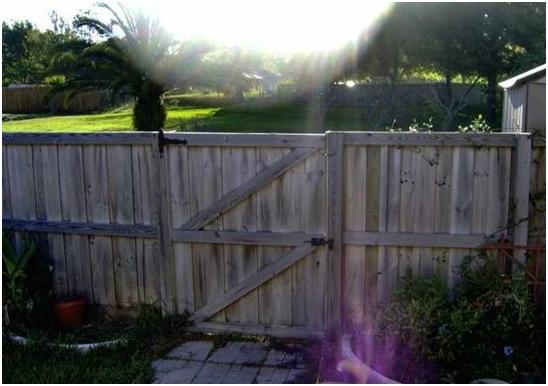 Many Orbs can be seen shooting forth from the sun in the daytime as well as the moon at night. Various amounts of light filters through them in the daytime, they project themselves from the sun literally riding the suns rays down into the earth. At night, as they travel downward they can be easily seen as their true self, pure energy. 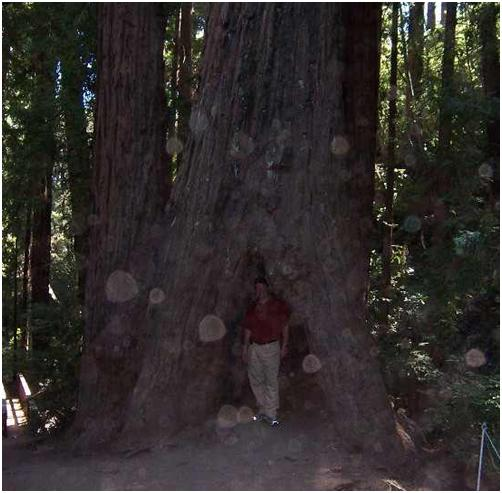 Orbs come in all different sizes and colors, yet the one commonality is that they are all round. This is the most efficient design. Being circular in form, they are "free form energy," just as an atom is. They can be translucent, bluish, or even a golden color to name a few, depending upon their personal level of evolvement. Some ancient ones bear the prism of the rainbow. 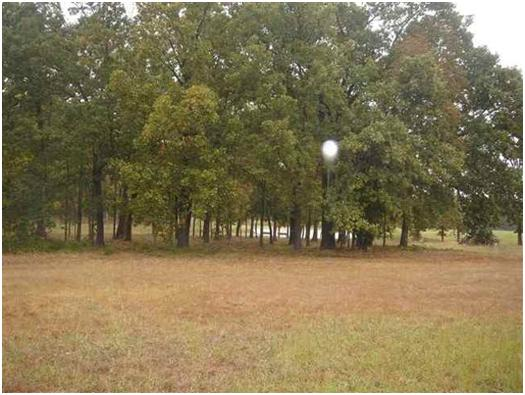 If you look closely enough, many times you will see faces inside the orbs. They come from many different planets, solar systems, galaxies. 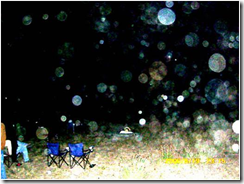 Orbs are Entities, Souls, Beings, Starkeepers from everywhere. They are record keepers, information gatherers and many tend to be childlike, because of their innocence. 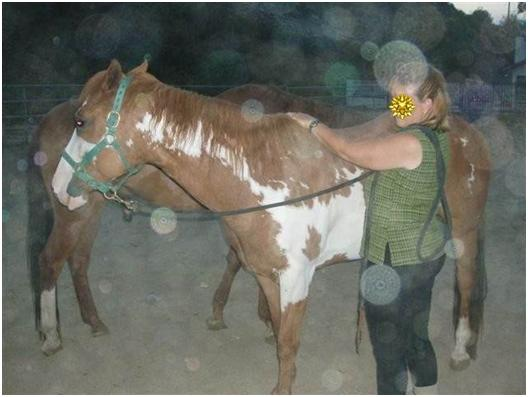 They are highly intelligent beings, performing important functions, much the same as humans do. Learning, teaching, gaining knowledge and wisdom, learning from the lessons we call life. They are here to experience, some just waiting for their next chance to reincarnate into physical form. As with all life forms, there are good orbs and bad orbs. 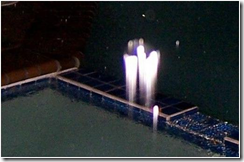 They are not all of the higher vibration levels or light as some know it. The lower vibration orbs tend to be parasitic, devouring another’s energy field to satisfy their needs or desires, caring not that it drains the host of his/her balance. For everything, there is the dark with the light, the good with the bad, there has to be a balance in all forms of nature. 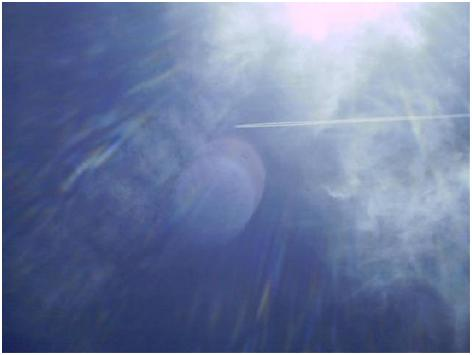 There are no words in the English language to describe what they physically consist of, orbs are not made of any type of material anyone on earth would be familiar with, yet the closest proximity would be plasma or pure energy. Each carries a lektonic tone that vibrates with each frequency existing in the space time continuum; a vibration that is unique to each, just as your Soul is different than any other persons, yet it is possible for them to share notes and be in harmony with others, while still retaining their individuality. They have a luminous quality to them and usually they travel in teams. 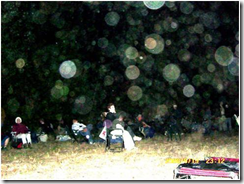 Orbs have the ability, using a process much like radar, to seek out others of their Soul Cluster. 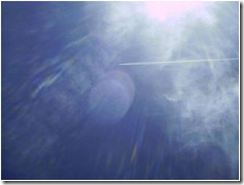 They are always in motion, yet Earth radar cannot see them and they cannot be captured. Their energy can be felt, much as brush against your arm or leg. If one were to use a very powerful black light, not the typical store type, you would be able to see them more clearly with the naked eye. They have the ability to transcend matter, to pass through solid objects. They can pass through walls, ceilings etc. as if they were not there. Orbs travel through the solar system using dimensional doorways, portals and such. Orbs flow through the planet to the center of Earth to deposit energy and then come back up to the sun and the moon to recharge themselves, always in constant motion with many traveling downward while others are simultaneously ascending. Orbs will transmit energy not only to the Earth’s core, they also carry it back to other planets to be held in storage units as well as to air ships. Just as we are, they are quite sensitive to radiation. Although this is a contradiction in terms, they themselves store radioactive particles which are housed within each sphere. 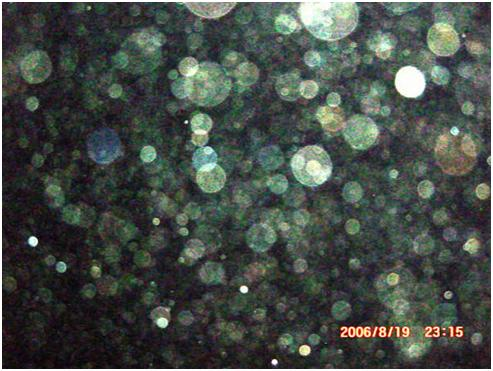 These particles are present because of the orbs interaction with all planetary objects containing radioactive matter. So why are they here now? They are an integral part of all planets and they have been here on Earth since its creation. Yet the greatest preponderance of them are here at this time on the Earth Star Planet. Why, the same reason that you are here on the planet at this time, the same reason there are so many "ships" in the sky at night, it is because they are well aware that the "axis of the Earth is shifting." The most pronounced notice of the planetary axis shift is the moon being out of time, the stars are not where they used to be, the constellations have shifted in the night sky and the sun has changed dynamically. They along with other Starkeepers, Spirit Guides and Master Teachers from all over the galaxies are here because of the severity of the problems this planet is facing; the dimensional and planetary shifting now occurring and to help in the convergence from the third dimensional reality into the higher dimensions. 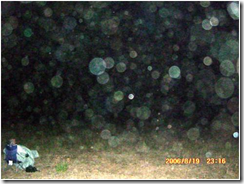 Many of you out there have been wondering if there is a connection between the "Twinklers" you see at night and the presence of orbs. Actually there is, Twinklers are comprised of millions of tiny orbs, orbs that are awaiting their time to come here to Earth or go to another planet. 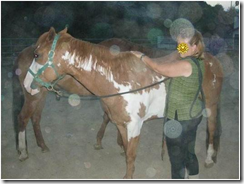 Their movement depends upon the need for energy at any one given time or place. Whether it is the energy depletion on any one planet or the energetic needs of the life forms that inhabit the planet. The orbs are energy efficient and require no maintenance other than the recharging from energy sources that flow freely throughout the universe. They have the ability to scan water sources for purity, they can tell the approximate lifespan of all plant and animal life. Because a part of their function is that they are record keepers, it is essential that the history of this planet be documented. 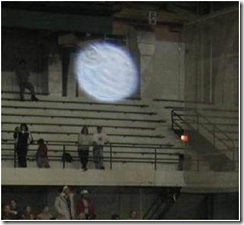 Orbs carry with them the memories and knowledge of all their past lives, as well as those of each planet they visit. As we do, they prefer to be around other life forms of similar vibration. Most are attracted to crystalline structures because of the pristine energy crystals emit. At times they have been seen following airships, others attach themselves to the jet stream of a passing jet, it appears to be a game to them to follow in their wake. Much like the other multi-dimensional beings that flow freely upon the planet, they are attracted to the higher vibrations or frequencies, such as those found in music, laughter, a child’s innocence, anywhere were fun and free flowing energy is of abundance. Those humans that have reached a higher level of consciousness or evolvement have an easier time seeing them with the naked eye, for they are also using the third eye in conjunction with the optical nerves. For these individuals, not only can they actually see them, they can feel their presence. The orbs know when people have reached this state and at this time they will come forward, attracted to you as you are to them and even allow themselves to be held in ones hands. Orbs love to be played with, you can hold them or even juggle with them. This is not true of any of the malevolent orbs. The malevolent orbs are out there planting their seeds of discord and disharmony; they align with life forms that are ready to be reaped. 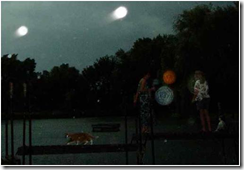 To date we have collected over 200 photos of orbs. 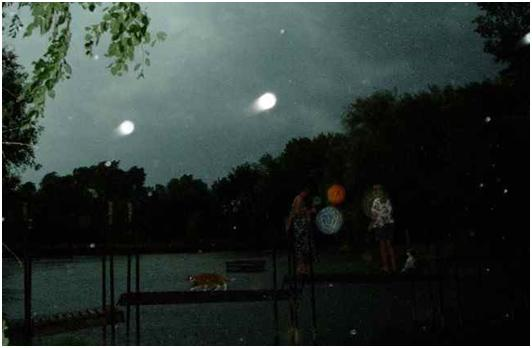 One of the most notable examples of a good atmosphere for orbs was at the fair one day. While photographing the event we found orbs were everywhere the children were playing, the rides, and the games and close to the sources of music. Yet we found they stayed away from the areas that were playing hard music and they didn’t seem to be particularly fond of the carnies themselves. I have personally been aware of orbs for two years now, my wife has been aware of their presence since 1991. I have become aware of one particular orb, one that calls itself "Minashi." Minashi appears to know more about me than I do, at times being, shall I say, very blunt with some of the answers to my questions, for they see only as things truly are. 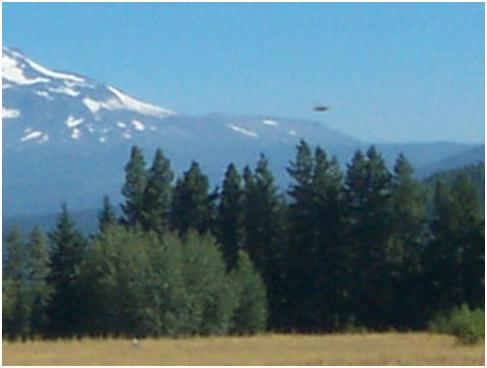 Orbs operate through telepathy; this is how they along with other life forms communicate. 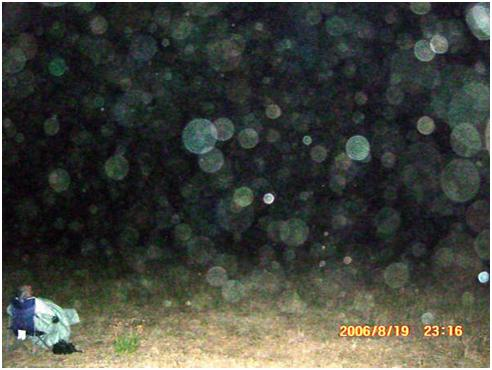 Orbs right now are a novelty to most people; however, what is being seen at this time is small in comparison to the numbers of them that will soon be appearing on this planet. As we have said, sometimes the truth is stranger than fiction, these are the facts. Continue on to the 2nd part in this series: Read the following title. Coming up we will be adding considerably more information on Orbs. We will be discussing their origins, why they are attracted to children and certain types of people. We will also be discussing the "energy streamers" that more and more are becoming aware of. 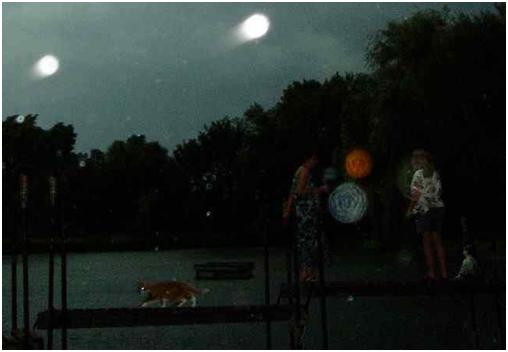 Rumors are going around from people "who don’t know any better" that orbs are actually ghosts, this is not true. Beehive tombs in Greece from Gen.